Technically I did take this shot on Sunday, even if it has taken a few days to post. As everyone knows, the weather in Auckland on the weekend got very wet. I braved a trip down to Long Bay anyway. Partly just to get outside. 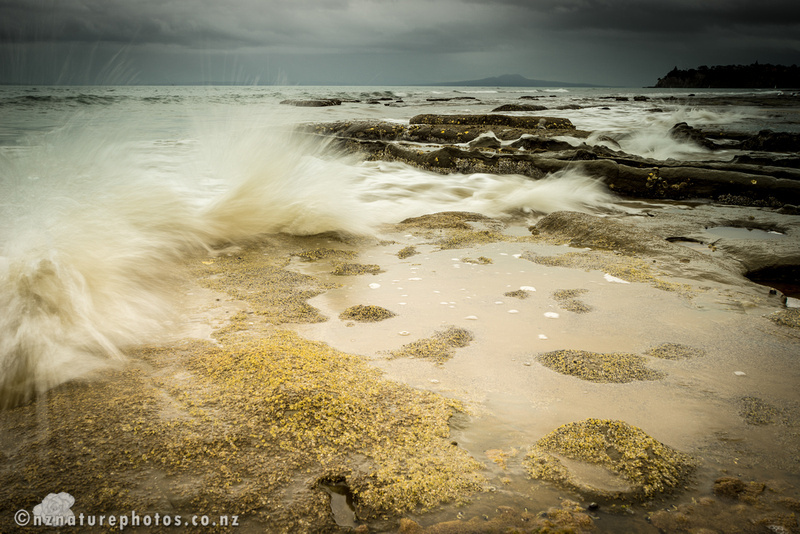 In between showers, I got this shot of waves hitting the rocks at Granny’s Bay. Rangitoto Island is on the horizon. A second later I had wet feet. But the camera stayed in position on the tripod. One of those reasons why having a good tripod and head is valuable. Photo taken with Sony a7R, Minolta 17-35mm f3.5 G and a Lee ND6 Grad.